The town of Bellagio was our home base for three gloriously hot days last August. 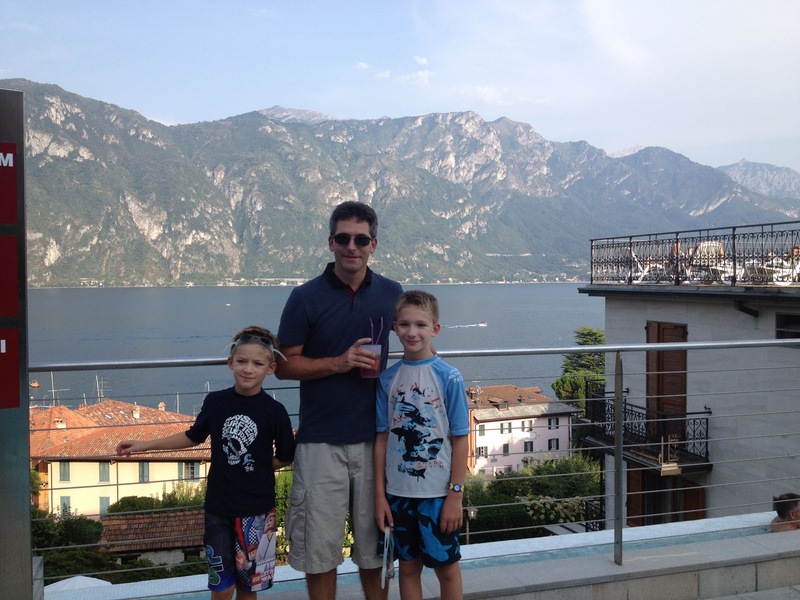 If you ask the little C&G's they will tell you the Hotel Belvedere is their absolute most favorite place anywhere in the world. Outranking even the Legoland Hotel in Billund, Denmark. Praise doesn't get any higher than that. The service was impeccable, and none of us could find any reason to leave the property during our stay. Except me (of course), who made the five minute trek into town to do laundry. There are plenty of hotels in the charming little Italian towns that cling to the shores of Lake Como, but very few with a pool. We knew after two weeks of traveling nonstop through Germany, Austria, and Italy, all four of us would be needing a break so finding a pool was a top priority. Some open green spaces to play was also at the top of the list and very hard to come by in the mostly vertical towns along the lake. 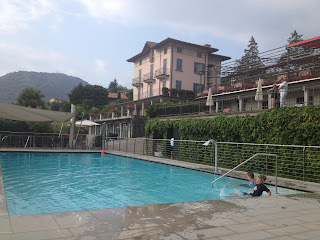 After seemingly endless research (although spending days looking at Italian hotels isn't such a hardship) I found the the perfect combination of pool and family friendly in the Hotel Belvedere. We emailed back and forth to arrange family accommodations, as they weren't an option on the reservation form on the website. We had a beautiful corner room with a small terrace and a stunning lake view. The living room had a pull out couch for Big C&G, and Little C&G slept in the twin bed in an alcove off the main bedroom. I know they each appreciated having their own space after so much time traveling together. 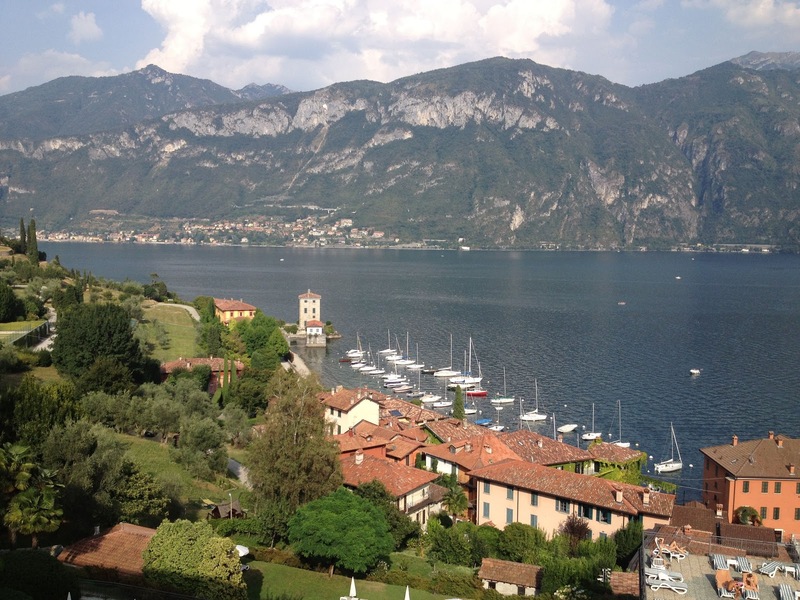 Rooms facing Lake Como are more expensive but totally worth it as the hotel is right on the road into Bellagio and that side could be a bit noisy. Apartments are also available and a good choice for families larger than four, or if you're trying to stay on a budget. With drinks, lunch, snacks, coffee and gelato delivered to you poolside, none of us could be motivated to venture into town. The breakfast buffet was extensive with plenty of pastries, fruits, meats, cheeses, cereals, and yogurts. Lunch was usually pizza and paninis under the umbrella next to the pool, and a glass of rosé or bubbly around cocktail time while watching the boys play in the pool. When we needed to get out of the sun for a bit we retreated inside to the lobby bar. The charming bartender brought the boys bowls of gelato and we had our gelato smothered with espresso (aka affogato). They played with their action figures in the front windows while Mr. C&G and I watched the stream of elegant guests coming and going through the terrazzo lobby. The Hotel Belvedere has been in the same family for over a hundred years, and it exudes old world elegance. 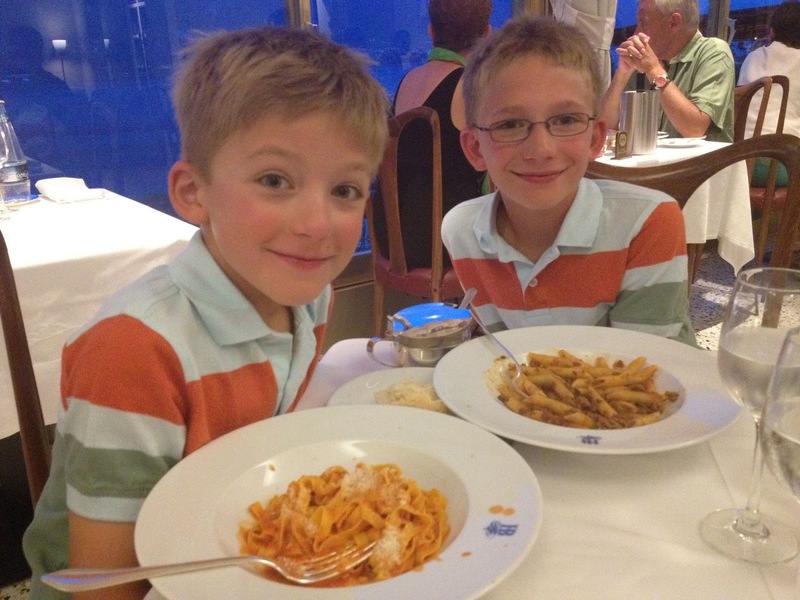 Dinner in the hotel was definitely a collared shirt formal affair. Each cloth covered table had an antique hotel key with your room number, indicating which table you were to be seated at. Service was impeccable, the food was amazing, and the view couldn't be beat. Not surprisingly the boys ordered pasta every night and somehow managed to make it through without sauce stains on the one fancy shirt I packed for them. Plenty of options for food or to go meals were just a short walk away in town. On my trip to do laundry I noticed several small grocery stores, a few gelato shops, and pretty restaurants along the waterfront near the ferry. We easily could have skipped the formal dinners in favor of a few slices of pizza and an evening stroll, but it was nice to just stay in one spot for a few days. And even nicer to be waited on in such elegant surroundings. The best thing about the Hotel Belvedere is it's repeat international clientele. Many European families come here year after year, and we would too if we didn't have a giant ocean to cross. In the pool the little C&Gs played with kids from England, France, and the Netherlands. They all became fast friends, and sometimes there was a language barrier but they all figured it out. The kids talked about what life was like in their countries, swapped school stories, compared football (soccer) teams, and learned so much from each other. And honestly, isn't that what traveling with your kids is all about?